The UK has relaxed its travel advice for the Kenyan capital Nairobi, removing cautions against travelling to "township or slum areas" of the city. The advice had been in place since 2007 following post-election violence. But concerns over terrorism mean warnings against travel to the city's Eastleigh suburb remain, along with two sections of the coast and areas within 40 miles (60km) of the Somalia border. Relaxing the travel advisory brings Nairobi in line with other cities. The Foreign Office says in other comparable cities worldwide it does not detail particular areas that may or may not be safe to enter. The advice it has relaxed warned against all but essential travel to "low income areas of Nairobi, including all township or slum areas". But it still urges UK citizens to be alert in such areas, particularly after dark and have awareness of local conditions at all times. 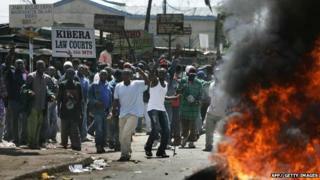 Kenya has previously opposed travel warnings from Western nations saying its economy suffers as a result. The Foreign Office is still advising against all but essential travel to the Garissa District, Eastleigh, Mombasa Island and Lamu County, due to high threats of terrorism and kidnapping. The Foreign Office says: "The main threat comes from extremists linked to al-Shabab, a militant group that has carried out attacks in Kenya in response to Kenya's military intervention in Somalia." In July this year the Foreign Office issued new advice warning Britons to avoid travelling to areas of the Kenyan coast, after attacks by militants in the counties of Lamu and Tana River left around 87 people dead. Areas of Eastleigh, Mombasa and North Eastern Province have also been at the centre of small-scale grenade and bomb attacks.